We are a leading Wholesale Trader of haemocytometers from Mumbai, India. We are one of the renowned manufacturers and suppliers of Haemocytometers. Haemocytometer also known as hemocytometer is a used to measure the strength of red blood cells in the human body. 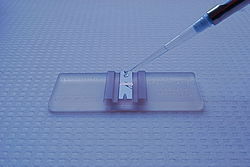 Hemocytometer is constituted with a thick glass microscopic slide that has two chambers. Length of each chamber of Hemocytometer is 1 mm squares. To get accurate prediction about cell counts of the body, both chambers of Hemocytometers should be completely filled with blood samples.